The Shorehouse's expansive sun deck (photo: Eleanor Marcon). Perth is synonymous with beaches, yet there are surprisingly few excellent ocean-facing restaurants. Fleur Bainger finds a stylish new arrival. They say you can turn up at The Shorehouse in thongs with sand still stuck to your toes. 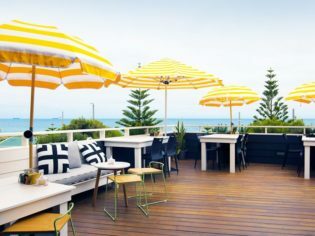 It’s a wonderful idea – and one that might catch on in time – but for now, the $3 million revamped restaurant facing Swanbourne Beach is a magnet for Perth’s beautiful people. Their leather sandals give way to razorback dresses, expensive jewellery and sleek bobs, or leather leggings and messy, Blake Lively-style plaits. It’s hard not to stare at all the privileged beauty – 90 per cent feminine with a dash of male-model lookalikes and a few silver foxes – in the white-on-grey room. The décor matches the clientele: breezy and smart, but not too showy. Weatherboard feature walls offset plush booths; a bar stool-height banquette grants ocean views; and bentwood chairs encircle tables leading to an expansive deck. You can’t go wrong with half a dozen of these (photo: Eleanor Marco). The Shorehouse could’ve gone either way but fortunately, there’s very little snobbery and a fair lug of fun. It comes down, perhaps, to owner Scott Taylor, himself often spotted in bare feet, whether at the beach or not. The loveable lad with charisma to burn has proven himself repeatedly in Perth, with the just relaunched Beaufort Local (formerly Beaufort Street Merchant), Enrique’s School For To Bullfighting bar, and fancy Trustee restaurant in the CBD. The Shorehouse exudes a playful vibe that suggests it will be no less successful than its siblings. For starters, it shares their love of polished booze, including five styles of Bloody Mary. I swoon over a smoky incarnation with a porcine twist, care of bacon-washed bourbon. My plus-one selects a lemongrass-licked gin and tonic from six options, so fresh he could down it all day. The wine list is impressive – and there are heaps of by-the-glass options. Bloody Mary with a porcine twist (photo: Eleanor Marcon). The kitchen is run by Oliver Gould, a chef who earned his stripes over nine years at Stokehouse in Melbourne, taking out the Good Food Guide’s Young Chef of the Year for 2014. The trademark of his coastal menu is clean food packed with flavour. Each dish is presented prettily, but there’s more substance than style, which is refreshing. Take the charcoal oven-finished Exmouth tiger prawns, tails blackened, gently smoked and heaving with baby caper tang. At five juicy crustaceans for $35 (I count them twice, just to be sure) they’d want to be good – and they are. Each prawn head slides off like it’s greased with Vaseline: expertly cooked. The simple dressing on the heirloom tomato salad – 12-year-old, sticky balsamic imported from Italy and Aussie olive oil – is so good I could drink it. More generosity could’ve been shown with the torn mozzarella morsels, but the flavours exploding from the black, red and yellow orbs mask the scroogery. Pert broad beans and house-made croutons cement this as the dish of the day. We eye off the raw seafood menu but opt for the crab linguine, slurping up its steamy broth sweetened with sea urchin paste and garlic slivers, wishing we’d ordered the larger dish. We exit as the sun’s glare turns the Indian Ocean silver, sucking in our tummies as we pass the glamour girls and, at last, pulling off our shoes to reach the sand. Verdict: People-watching and ocean views provide the eye candy, while the food is strong enough to demand a three-way attention split. With breakfast recently added to the mix, there might be more thonged feet coming directly from the beach. We rated: The outlook is dreamy, particularly if you’re under the front deck’s stripy yellow umbrellas. We’d change: The service was distracted, forgetting the tables that weren’t raucous and boozy. Notes: It’s ferociously busy so be sure to book and plan for at least $60 per head, more if celebrating the view with a few glass clinks. Also, the beach to the far right is clothing-optional – expect to blush if you wander too far along the sand! All AT reviews are conducted anonymously and our writers pay their own way – so we experience exactly what you would.